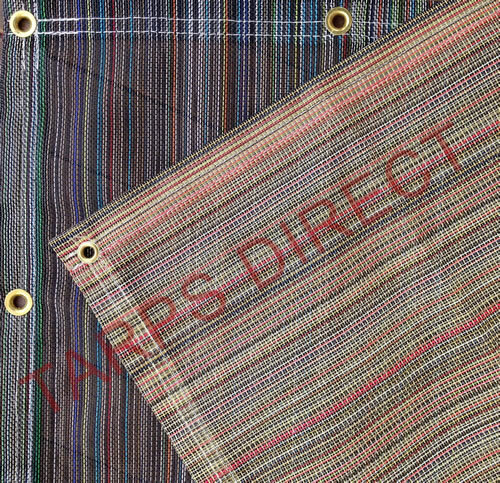 Tarps Direct's Multi-color, vinyl coated mesh tarps are a 10 ounce weight with an 11 x 11 weave count that offers fifty (50) percent shade. The tarp has heat sealed seams with web-reinforced hems and brass grommets in the corners and on all sides that are approximately 24 inches apart. Besides providing shade, this product is great for fences, dump truck covers, trailers, wind breaks as well as agricultural and industrial applications. Due to the unique nature as well as manufacturing process of this product, we do not guarantee that colors will be consistent throughout the tarp. Variances in the color/shade may occur throughout the tarp. This is a first quality product of exceptional value but is woven with numerous colored fibers that cause tonal/shade changes. If color is important please order the vinyl coated mesh in a solid color. NOTE: READ DESCRIPTION ABOVE. PICTURE BELOW IS ONLY AN EXAMPLE - COLOR WILL VARY AND NO TWO ARE ALIKE.